combining two loves, buttons and bows. https://www.cutoutandkeep.net/projects/button-down-your-bow • Posted by Maricela Z.
I love bows and buttons so I decided to combine both. I went to Michael's and purchased a bad of mixed buttons and I chose some to put on my bows. For this project I used red ribbon, red threaded (depending on the color of the ribbon). I also used scissors. 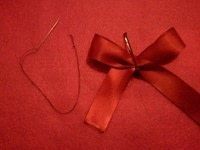 I made a bow shape by folding the red ribbon and then used thread to keep the shape. 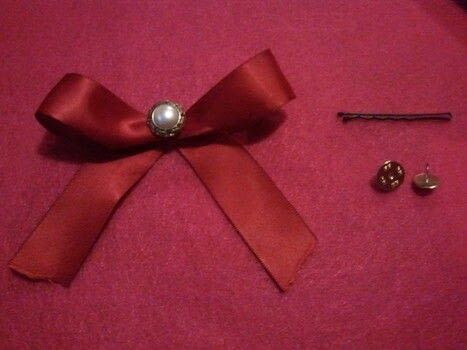 I used a bobby pin here to demonstrate the bow shape. 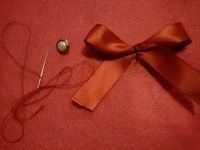 Once you've tied down the bow you can sew your button onto the bow. At this point I would glue a bobby pin to the back to use in my hair or glue a pin tack to wear on my shirts, depends on you.